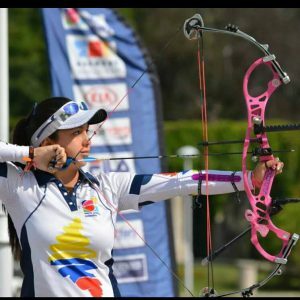 Sara López (born 24 April 1995), is a Colombian athlete who competes in compound archery. She first competed for the Colombian national team in 2011 Pre-Olympic event in Medellin, Colombia. In 2013 won medals at the 2013 World Games in Colombia and the FITA Archery World Cup, at which she qualified for the final. She rose to her highest world ranking of 3 in 2013, and her major achievements include winning the 2014 Archery World Cup. As well as competing internationally in archery, she is a medical student. López is the current world record holder for a 15-arrow round and other 10 world records, having become the first woman to shoot a perfect 150 at stage 3 of the World Cup in Medellin.